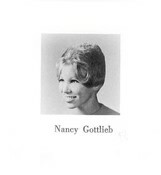 Pam Soffrin informed us that Nancy passed away. Always a private person, Nancy never told anyone( not even family) but quietly battled the cancer that took her life October 29, 2018. Nancy retired from the medical tecnology field and lived with her daughter Rebecca in Clearwater, Florida. She had been previously married to Stuart Cohen who remaind in her life.